This post is part of Thesis Chronicles. The Enabling City describes a city that allows for everyday collaborative experiments, where anyone can unlock their creative potential and embark on a transformative journey to become a more involved citizen. This series is based on a free online toolkit, which documents the growing movement of creative, collaborative initiatives and the ripple effects they are having on the way we think of both cities and the commons. In particular, The Enabling City uses a ‘place-based creative problem-solving‘ framework to create a dialogue around how to leverage the imagination and inventiveness of citizens, experts, and activists in efforts that make cities more inclusive, innovative, and interactive. Place-based creative problem-solving allows citizens to uncover their own areas of expertise and monitor their well-being in relation to that of their community, for example, by creating opportunities for local resource-sharing, or experimenting with new, citizen-initiated investment models. This approach empowers residents to tackle social/urban needs in a localized way, which they can then bring to scale. By focusing on creativity, cities can foster open-mindedness and innovative thinking, helping communities articulate their needs and visions in ways that celebrate the spaces and places that are at the core of their everyday reality. Social innovation thrives on the ideas and efforts of social entrepreneurs and creative individuals whose socially conscious work benefits both people and the environment. The toolkit features a total of forty examples across six categories: placemaking; eating and growing; resource-sharing; learning and socializing; steering and organizing; and financing. As the categories suggest, the examples are diverse and far-ranging, but they all focus in one way or another on values such as collaboration, transparency, and participation. This week, we focus on the first category in the Enabling City toolkit, “placemaking,” and introduce you to two of the initiatives included in The Enabling City. 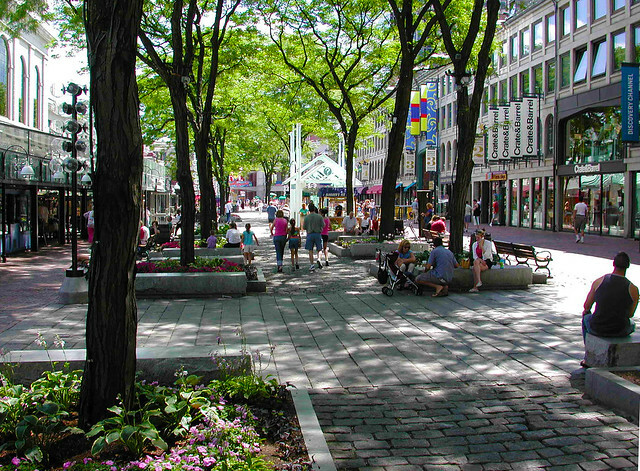 “Placemaking” refers to initiatives where citizens capitalize on local assets in order to create a strong sense of place. “Placemaking capitalizes on a local community’s assets, inspiration, and potential, ultimately creating good public spaces that promote people’s health, happiness, and well being.” – Project for Public Spaces. Image by Urban Grammar. Started in 2007 to honor the legacy of urban activist Jane Jacobs, Jane’s Walk is a Canadian innovation that bridges social and geographic gaps by bringing residents together through a series of free neighborhood walking tours. These events explore a wide range of urban landscapes and celebrate walkable neighbourhoods, urban literacy and the idea of people-centered cities. In 2010, walks took place in 68 cities and included over 418 tours offered by volunteer group leaders, sending a strong message that people want and need opportunities to build community with those with whom space is shared. Cittaslow, also known as Slow Town, is a growing international network of over 140 towns in 20 countries that have adopted a set of common goals and principles to enhance quality of life for both for their residents and visitors. Inspired by the Slow Food movement, each Cittaslow town commits to working towards a set of 50 goals that provide tangible benchmarks against which a town can measure its progress. The aim of obtaining an affiliation with Cittaslow is to act as a mechanism for bringing locals together to work collectively for the good of their town, with results ranging from greater support for local businesses, to a stronger emphasis on local traditions, increased environmental protection, and enhanced participation in community life. How would your city benefit from open, collaborative spaces for participation? We hope that this post will stimulate your imagination and encourage you to experiment with place-based creative problem solving online, offline… or maybe both! For other examples of innovative place-making initiatives, you can download a copy of The Enabling City. Chiara Camponeschi works at the intersection of interdisciplinary research, social innovation and urban sustainability. Her latest project, The Enabling City, is based on graduate research conducted at York University’s Faculty of Environmental Studies in Toronto, Canada. To learn more about the project, visit the website or follow The Enabling City on Twitter. Great that you wrote about the international Jane’s Walk movement! In fact, a group of Cantabrigians is planning our third annual Jane’s Walk here in Cambridge, MA, to be held on May 7 at 10:30 am. Soon we will post our walk description and meeting place on the Jane’s Walk USA website (probably listed under Boston). In addition, organize your own walk too. Incidentally, there will be a panel presentation about Jane Jacobs and Jane’s Walks at the main Cambridge Public Library’s lecture hall on Tuesday April 26 at 6:30. Free and open to the public. Love the post and so excited you’ve highlighted our work at Jane’s Walk USA. Looks like Glenna has beat us to saying hello. I’ll echo her comments and say we’d love to have you or anyone else up there in Boston participate in Jane’s Walk this year. The events are May 7-8, 2011. Please visit our website http://www.janeswalkusa.org and feel free and contact us any time! Looking forward to helping you out in any way we can.